The Herricks Highlanders (overall 3-2, conf 1-2) lost a tough dual match 42-29 to a strong Baldwin team on Bruin senior night, Friday, January 4, 2019 and were eliminated from qualifying for dual team playoffs. As always, Coaches Goldberg, LaMaida and Bianco had the team ready for the challenge and the Highlanders wrestled hard. Joseph Manfredi fought off his back in the first period and came back to pin his opponent in the second period at 99lbs. Joseph Mattei dominated in his match and pinned his competitor in the second period at 113lbs. Aaron Cho (120lbs), Marcus Osieczkowski (138lbs), Co-Captain Cole LaRock (152lbs) and Ash Multani (285lbs) all won their matches by decision while Co-Captain Daniel Mattei (170lbs) won by major decision. Kumel Arif (106), Kailen McCauley (126), Quinn Gilhooly (132), Justin Chin (145), Ali Shahid (160), Krish Patel (182), Syed Hasan (195), and Nate Dowd (220) all wrestled formidable opponents and lost. On Saturday, January 5, 2019, Herricks hosted their annual New Year’s tournament in the mecca of wrestling, the Herricks Community Center. Teams that entered the tournament included Nassau squads from East Meadow, Great Neck North, Hempstead and Massapequa, Suffolk county teams Huntington, Southampton and Ward Melville and St. John the Baptist from West Islip. The Herricks Highlanders (overall 3-3, conf 1-3) hosted the Long Beach Gladiators on January 8, 2019 in the mecca of wrestling, the Herricks Community Center. Coaches Goldberg, LaMaida and Bianco put forth a competitive Highlander line-up, but the top five Nassau County powerhouse Gladiators were stacked and Herricks lost 67-14. The Herricks grapplers came away with three victories: Joseph Manfredi dominating his opponent 16-0 with a technical fall at 99 lbs, Joseph Mattei winning 9-6 in the last 20 seconds of the contest after controlling the match for more than two periods and Kelsey Alvarado getting a pin in the second period at 182lbs. All the Herricks wrestlers performed valiantly against a team that had almost half of its fifteen-man line-up ranked top six in Nassau County. Kumel Arif (106lbs), Quinn Gilhooly (120lbs), Aaron Cho (126lbs), Sal Puliafico (132lbs), Marcus Osieczkowski (138lbs), Ali Shahid (160lbs), Daniel Mattei (170lbs), Nate Dowd (220lbs), and Ash Multani (285lbs) all gave their best, but lost. There were also 10 JV matches with the Highlanders winning three: Rayan Abdolahzadi (132lbs) with a third period pin, Marvin Lee (160lbs) with a second period pin and Georgios Tsoumparriotis (170lbs) with a decision 8-4. 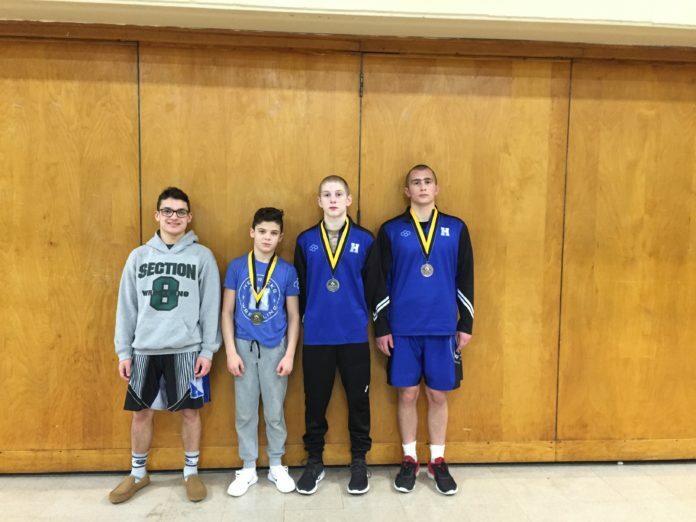 Others wrestling but not successful were Daniel Fatahi (106 lbs), Ramahan Adil (113lbs), Daniel Dunn (113lbs), Kevin Chan (132lbs), Justin Chin (138lbs), Emeril Peralta (170lbs) and Krish Patel (182lbs). The Herricks Highlanders (overall 3-4, conf 1-4) hosted their last conference dual match against the Plainview-Old Bethpage JFK Hawks on January 9, 2019 in the mecca of wrestling, the Herricks Community Center. The match was expected to be close and it didn’t disappoint. Coaches Goldberg, LaMaida and Bianco strategically aligned their wrestlers against the Hawks. The Highlanders were able to win 7 of the fifteen matches, but fell short in score 45-33. Kumel Arif (106lbs) and Co-Captain Daniel Mattei (170lbs) both pinned their opponents in the third period. Joseph Mattei (113lbs), Quinn Gilhooly (120lbs), and Aaron Cho (126lbs) all won by decision while Joseph Manfredi (99lbs) and Matthew Polo (285lbs) both won by forfeit. On Saturday, January 12, 2019, Herricks entered a very competitive Baldwin tournament along with fourteen other teams from Nassau and Suffolk: Baldwin, Bellmore-JFK, Carle Place, East Meadow, Lindenhurst, Locust Valley, Long Beach, MacArthur, Massapequa, Roslyn, Sewanhaka East, Valley Stream South, West Babylon, and Westhampton Beach. There were many elite and top ranked wrestlers from both counties spread throughout the brackets.